All students are expected to wear correct school uniform at all times. Students attending this school benefit from its reputation and we expect students to help to maintain that reputation by their high standards of behaviour and appearance, both in school and in the local community. Parents whose children are allocated places here are expected to support the school policy on uniform. At Parkside Academy, our priority is on outstanding education for all of our students. It is unacceptable for teachers to have to use valuable teaching and learning time debating with students whether or not they are wearing correct school uniform. To avoid such situations, which disrupt effective learning and can damage working relationships, parents are expected to ensure that their children wear the correct school uniform. Black Blazer: with school badge attached to the left breast pocket. Plain black trousers:plain black, full length, smart trousers with a zip. Please note that the following are not acceptable: casual or fashion trousers including jeans or any trousers in a jean cut, leggings, jeggings, combat trousers, low-slung or skin tight etc. (i.e. trousers should be loose at the calf and ankles). Only narrow, unobtrusive black belts are acceptable; no fashion belts or large buckles are allowed. Plain black skirt: we do not recommend skirts for school wear as they tend to be short and impractical. However, if students wish to wear them, plain black skirts of knee length with opaque black tights are acceptable (Note: no tube skirts, lycra skirts, fashion skirts etc., and no footless or patterned tights). White shirt: plain white formal school shirts, to be tucked in to trousers/skirts. It is an expectation that top buttons will be fastened. Black school shoes: plain black, sensible shoes (with no other colours or logos). No trainers, canvas shoes, casual shoes or boots such as Rockports, Timberland, Uggs etc. If students arrive with incorrect footwear, they will be expected to borrow school shoes. Sweatshirts/sweaters (Optional): black, v-necked sweatshirt, a black v-necked tank top or a black v-necked sweater, each with the Parkside logo may be worn. No other sweatshirt, sweater, cardigan, or jumper should be worn. Hoodies are not allowed. Equipment list: All students will need a pen, pencil, ruler, scientific claculator and a suitable bag to carry books, equipment, P.E. kit etc. A planner will be provided at the start of the year but replacement planners will have to be paid for by students. Jewellery: the only jewellery allowed is one small set of gold or silver ear studs and/or a wristwatch. Inappropriate jewellery will be confiscated. Hairstyles: hair should be tidy, clean and suitable for a working environment, e.g. no hair dyed in unnatural colours; no hairstyles representing cults/gangs e.g. Mohican, Goth etc. ; no hair shaved or lined or dyed in strips, patterns, initials etc. Long hair must be tied back for practical subjects. Make-up: if used at all, should be light, discreet and not excessive. We discourage the use of ‘fake tan’. Coloured nail varnish, acrylice and gel nails are not allowed. Piercings and tattoos: facial and visible body piercings are not allowed. Covering up piercings with plasters is not a solution – please do not arrange piercings to coincide with term dates as students will be asked to remove inappropriate studs in line with policy. Tattoos are illegal under the “Tattooing of Minors Act, 1969”. Sports training shoes; traditional style, not plimsolls. P.E. lessons continue to be taught outdoors throughout the winter so the outdoor top (note: not the uniform sweatshirt) and/or base layer are strongly recommended. We would suggest that students have their name in P.E. kit to ensure it is easily identifiable. Students are expected to wear kit when unwell or injured as they are still part of the lesson. All jewellery must be removed during P.E. lessons. Parents of students with body piercings must sign a disclaimer if they want their child to wear the piercing. This does not include ear studs. Parents are reminded that the school cannot accept responsibility for items lost, damaged or stolen from changing rooms, such as ipods and mobile ‘phones. 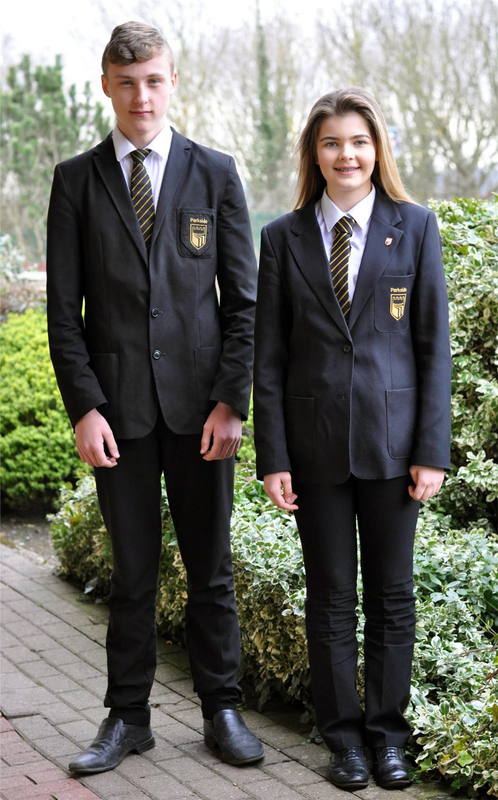 Requests to vary the school uniform due to religious beliefs and ethnicity will be considered by the Governing Body. All items of Academy uniform can be ordered through Emblematic and all orders can be made by accessing their website www.emblematic.co.uk or alternatively this may be accessed via a direct link from the Academy website www.parksideacademy.org.uk. Should you not have access to the internet, alternative arrangements can be made for the ordering of uniform. Please contact the school office. Telephone number for Emblematic: 0191 2701449.